1989: Former mercenary Trevor Dillon came to Pine Valley on the behest of ex-partner Jeremy Hunter. Trevor got a job as a detective for the Pine Valley Police Department. He finally met Natalie Hunter, the woman Jeremy had obsessed about years ago. Suffice to say, Trevor was not very impressed. At least, that was the heir that he would let on. Secretly, he felt a great attraction to Natalie. 1990: As much as Trevor wanted to avoid it, he found himself orbiting around Natalie. He futilely tried to hide his true feelings for her. The couple was shipwrecked when Trevor tried to drive Natalie’s yacht. Trevor gave in to his feelings, and he was surprised when Natalie reciprocated. Trevor almost did not want to be rescued. But, happiness proved to be fleeting when the couple came back to Pine Valley. 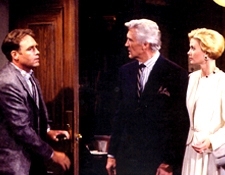 Natalie entered into a marriage of convenience with Adam Chandler. Trevor despised Adam. He knew Adam was just looking to profit from Natalie’s newfound wealth. On Thanksgiving Day, Trevor welcomed his niece Hayley Vaughan. Hayley had ran away from home after the death of her father. Hayley’s mother, Trevor’s sister Arlene Vaughan, had fallen off the wagon. Trevor knew he could provide the stable home that Hayley needed. Trevor’s first big case was the kidnapping of Dixie Cooney by Billy Clyde Tuggle. With new partner lieutenant Derek Frye, they tracked Billy Clyde to his hiding spot in the woods. After an intense standoff, Dixie was rescued. But Billy Clyde’s terror continued when Trevor’s new friend Tad Martin fell victim to a bridge bomb he had planted. 1991: Arlene came to claim her daughter. But Trevor wanted to protect Hayley. He thought he failed when Hayley was arrested for driving drunk and almost killing Brooke English and her unborn child. Really, Arlene was the woman behind the wheel. Arlene had even more secrets to reveal. Years ago, she had had an affair with Adam Chandler resulting in her pregnancy. Adam was Hayley’s real father. Hayley made the decision to move into Chandler mansion. Trevor left the Pine Valley Police Department to open his own Private Investigations Agency. Luckily, he was able to use Derek as his contact within the department. Natalie left Adam and made her way back to Trevor. They did not waste any time in getting engaged. Trevor opened his home to Natalie’s recently divorced sister, Janet Green. Trevor put up with Janet for Natalie’s sake. The mentally unstable Janet became infatuated with her sister’s fiancée. Unbeknownst to Trevor, Janet coached herself to successfully impersonate Natalie. She kidnapped her, threw her in a well, and seemingly took over her life. Trevor married Janet none the wiser about her true identity. Dimitri Marick had rescued Natalie. Janet’s charade was revealed and she was carted off to prison. But, Janet had a bombshell for Trevor. She was pregnant with his child. 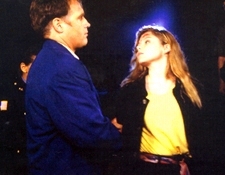 1992: Natalie had told Trevor their engagement was over. She made plans to marry Dimitri. But, that all changed the night Natalie announced their engagement. Dimitri’s first wife, Angelique Marick, was revealed to be alive and living in Wildwind. She ran out of the castle and back in Trevor’s arms. But their relationship was not fully healed. 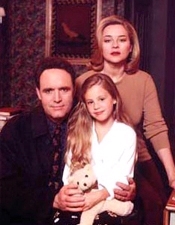 Natalie told Trevor she could never be with him if they were forced to raise his and Janet’s baby. Trevor had become preoccupied with Hayley and her growing addiction to alcohol. She had recently eloped with Will Cortlandt, who fueled her addiction. Trevor and Will got into very many loud and public arguments over Hayley’s wellbeing. After threatening him publicly, Will was found dead in his apartment. Trevor was among the many suspects investigated for the murder. The true culprit turned out to be none other than Janet who believed Will had taken Trevor’s attention away from her and their baby. Janet went on the run with Natalie. She had intended to finally rid herself of her sister. But before she could kill Natalie, Janet went into labor. Amanda Dillon was born and rushed to the hospital. There, Janet was taken back into custody. Trevor promised Janet that she would never have anything to do with their daughter’s life. The ordeal brought Trevor and Natalie back to together. Natalie could finally accept Trevor’s daughter. They had an impromptu wedding at the Wallingford Estate. Trevor also formally adopted Natalie’s son, Timmy Hunter, whom he had grown very fond of. Assistant District Attorney Galen Henderson turned to Trevor when she thought her life was in danger. Her abusive ex-husband, Carter Jones had just been released from prison and wanted her back. Trevor protected Galen as Carter stalked her. Believing Trevor was keeping him from his wife, Carter set Trevor’s house on fire as a warning. Only, Natalie was inside and trapped by the flames. Trevor rushed in to save her. At the hospital, Natalie recovered but could no longer see. Trevor learned Natalie’s new hospital orderly friend Kyle was none other than Carter. He tracked Carter down to his houseboat where they got into an altercation. Carter jumped overboard and was able to escape Trevor’s pursuit. When Carter turned up in Corinth, Trevor sent Jeremy to investigate for him there while he helped Natalie recover. Just as Trevor thought all hope was lost for Natalie to regain her sight, a Christmas miracle blessed the Dillon family. While looking at the angel affixed to the top of the Christmas Tree, Natalie’s blurred vision became clear. She could see again. 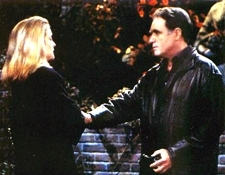 1993: Trevor did not trust Natalie’s new friend, Laurel Banning. Laurel was the accountant for the Mason Foundation. Natalie learned that Laurel had embezzled money from Foundation. In pursuit of Laurel, Natalie got in a fatal car accident. Trevor watched as she laid brain dead in the hospital. Trevor was forced to let his doll go. Timmy fell into a deep depression as a result of Natalie’s death. Timmy began abusing drugs. His addiction was apparent to everyone but Trevor. While under the influence of LSD, Timmy almost got run over by a car. Laurel pushed him out of the way at the last moment. Trevor realized that Timmy had a problem. He was also forced to confront Laurel. Laurel revealed that she had embezzled the funds to keep her autistic daughter, Lily Benton, in a special school. Laurel helped Trevor come to grips with Natalie’s death. Trevor turned to Jackson Montgomery to study for the Pennsylvania Bar exam. With his help, he became a defense attorney. 1994: Trevor defended Jamal Wilson in his suit to separate from his biological father, Alec McIntyre. Alec dropped his claim of custody so that the Cudahys could adopt him. At home, Trevor appreciated Laurel’s help in raising his children. He was beginning to date again when he met Jane Cox. Jane instantly fell in love with his children. Laurel was weary of Jane, but Trevor thought that he had found a perfect match. He asked Jane to marry him. Unbeknownst to Trevor, Jane was none other than Janet in disguise. On the wedding day, Timmy’s dog Harold attacked Janet. It bought Jackson enough time to come with Laurel’s evidence of Jane’s true identity. Trevor lashed out at Janet and promised her that as long as he was alive, she would have nothing to do with Amanda. 1995: Trevor’s custody suit for Amanda took a turn when a witness named James came to the stand. James testified that Janet had hired him to impersonate Will so as to stop Dixie’s smear campaign. The judge awarded full custody to Trevor. Trevor made plans to marry Laurel. On their wedding day, Janet made another appearance. This time, she had a bomb and was ready to take out everyone in the chapel who had caused her pain. Only, Amanda was at the front of the chapel with Laurel. Janet ran out in hopes of disarming the device. Before she could, a bolt of lighting struck her down dead. Laurel and Trevor married thinking Janet’s reign of terror was behind them. Laurel confided in Trevor the fact that her brother, Michael Delaney, was a homosexual. Trevor overreacted to the news. Michael had taken Jamal and Timmy on a camping trip. Trevor went into the woods to retrieve his son. He told Laurel Timmy was to never be left alone with Michael. One day at the hospital, Trevor came face to face with Janet, back from the dead. He took Janet captive in an empty storage locker. Trevor berated Janet with all the pain that he had caused his family. In a rage, Trevor was ready to kill her once and for all. Pierce Riley, one of Trevor’s old mercenary friends, had tracked him down and stopped Trevor from committing the crime. 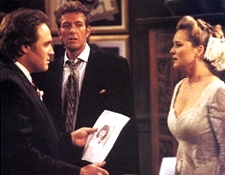 Pierce appealed to Trevor’s love for Amanda to stop him from killing Janet. Trevor agreed to let Janet go, but warned her to stay away from his family. 1996: Trevor agreed to defend Michael when the school board fired him for his sexual orientation. Laurel and Michael were guests on The Cutting Edge to talk about the situation. Unbeknownst to everyone there, a drunk Jason Sheffield was in the rafters with a gun, intent on killing Michael. But since he was inebriated, Jason missed Michael and shot Laurel instead. The doctors did their best, but Laurel was brain dead. Trevor was forced to say goodbye to another woman he loved. Trevor got wind of Janet’s newest plot to take over Brooke English’s life. When he got in a car to stop Janet, he got in a crash that left his paralyzed. After Laurel’s death, Trevor lost his will to live. Janet came to tell Trevor not to give up. His children needed him. When Janet threatened to take Amanda away, Trevor found the ability to lift himself out of his chair. 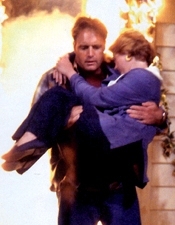 1997: The ordeal of the last year had brought Trevor and Janet together. But as their relationship blossomed, Trevor’s relationship with Tim grew estranged. Tim accused Janet of locking him in a meat locker. When Trevor noted inconsistencies in his story, Tim admitted that he had lied. Ashamed, Tim ran away from home. Trevor did his best to find his son. Janet had left Trevor believing that she was cause for their estrangement. On Christmas Eve, Tim made his way home. He asked for forgiveness and told Trevor that he was open to Janet being a part of their lives. 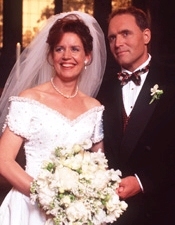 1998: Trevor proposed marriage to Janet. But Janet began to act strangely. Out of nowhere she announced that she was going back to her ex-husband, Axel. Trevor’s investigative instinct told him something was not right. He found out that Axel was an actor hired by Janet. 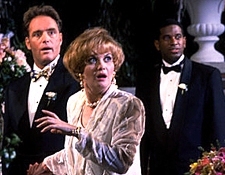 At their supposed wedding, Trevor arrived and revealed Janet’s ruse. He proposed one more time to her. 1999: Trevor caught Janet looming over the dead body of her former cellmate, Sophie Malinowski. Janet told Trevor about how Sophie was blackmailing her for money. Janet reached her breaking point when Sophie threatened to hurt Amanda. Trevor knew that Janet would be sent back to prison if she was implicated in the murder. So, Trevor went to Derek to turn himself in. After filing his statement of guilt, Trevor slipped out of the police department. Trevor went home to kiss his little girl goodbye. Then he slipped out of Pine Valley before the authorities could catch up with him. 2000: Trevor found enough evidence to corroborate Janet’s claim of self-defense. He invited his family to join him in Colorado. 2005: Janet stopped taking her medication. After a heated argument with Trevor, she stuck him in a freezer to cool off, accidentally killing him. Janet brought Trevor’s dead body to Pine Valley, thinking she would be able to revive him whenever she wanted.